From the parking lot, ride east on Butler St. (toward Marietta College) and it dead ends just after crossing 7th St. 4 blocks from the parking lot. 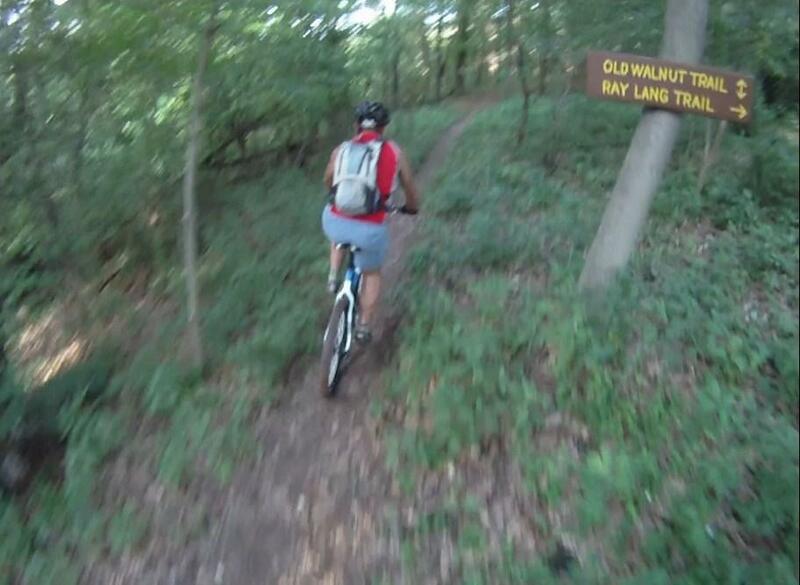 Old Walnut Trail begins at the dead end. It will lead you around to a sidewalk and green grassy area. Ride through the grassy area to the road, and stay right. Climb for about 150 yards, watch for sign across from the first school building you come to. Old Walnut will go into the woods here. Since we like to use this trail both directions we usually leave this section of Old Walnut for the return trip, so within 100 feet after entering the woods near the school go right on Ray Lang Trail. Follow it around till you will cross Old Walnut trail again. It's a strange intersection, however you will be bearing to the left in the intersection, just not a hard left. Ray Lang Trail will bring you out on Glendale Rd. If you take a left on Glendale, then a right in about 100 yards, go past McDonalds and right at the next intersection and go into the gravel parking lot above the Subway Restaurant you can pick up North Hills Trail there which will take you right to Kris-Mar Woods. Do some loops through Kris-Mar and just save Glendale trail for your exit. When you have looped Frontier Loop Trail and hit Chimney Trial come back around to North Hills Trail and then hit Glendale Trail up to Look Out Trail (at the big city water tank on top of hill and awesome overlook of city). Then come down a bit and take Glendale Trail back around to Glendale road. Take a right on Glendale and you'll be back at Ray Lang Trail where you came out. Just make the climb back up, then take a right at the wierd intersection onto Old Walnut Trail and return. Now, that is only a short loop. If you want more, don't take Glendale Trail out of Kris-Mar, go out North Hills Trail (May still have signs showing NCT). It will dump you out on Glendale Rd. at the top of the hill. Go left on Glendale, then left at next road, Cisler Dr. Follow Cisler Drive till you ride past a large right of way. You will come up to a building on your right and just past that building as you start up a little grade, Cisler Trail will shoot into the woods on your right across the ditch. If you miss this one, just turn right on the next road to your right (Jackson Park) The trail crosses it in the first 50 feet. If you go left there it will drop you into the High School Trails. See map on those. Review: A few banked turns and a couple of dirt jumps and one rock pile u have to go down i would recomend this for begginers or someone who is looking for a easy ride. This trail can get muddy so please allow a couple days after it has rained to go riding. City Trails - Marietta Middle School MTB Trail 3.00 out of 5 based on 2 ratings. 2 user reviews.